I've recently become obsessed with baking and am trying to make a variety of different things I haven't done before. One of the baked goods at the top of my list to do was a Lemon Drizzle Cake as they are one of my favourites and anything with icing on the top is a winner in my book. I was surprised by how easy it is to bake and the little ingredients you need to do so! I have baked it a couple of times now and still love it just as much as the first time I made it. 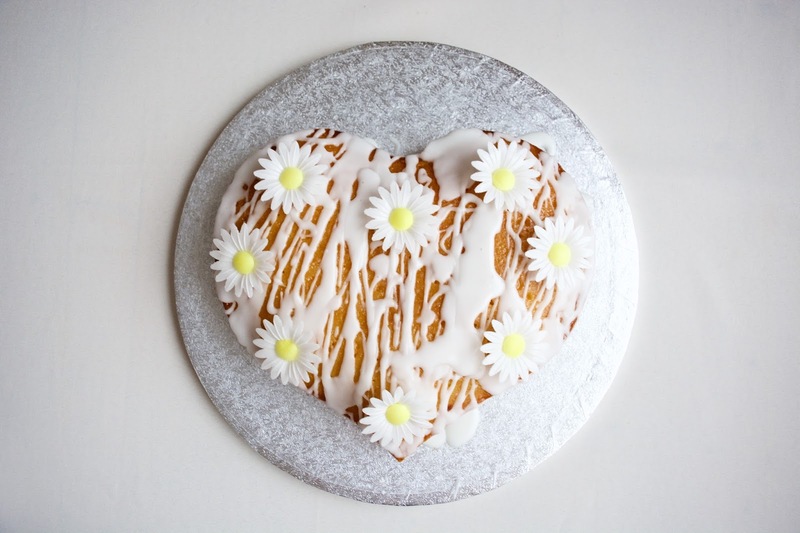 The first time I made my Lemon Drizzle Cake, I wanted it to be a little bit girly so I baked it in a heart shaped mould and decorated it with some pretty edible daisies. Very instagramable! Cream together the caster sugar and unsalted butter until smooth, I find it easier to cream it together with a mixer as I have very weak arms and a mixer speeds up the process. Then blend in the eggs, self raising flour and zest of two lemons. Once well mixed it is ready to go in the oven, it takes roughly about 30 minutes to cook and just check with a knife before taking it out that it is in fact done. When the cake has cooled down it's time to do the lemon icing sugar!! I put the icing sugar on whilst it is still in the mould as it makes applying it a lot easier and it dries nicer. I like to do a very watery layer first, with the the juice from one lemon and a tiny bit of ice sugar to add more flavour to the cake. The second layer of icing sugar is a lot more thick as you can see by the picture above, so minimal lemon juice and lots of icing sugar. And voila you have yourself a tasty Lemon Drizzle Cake!